Consider it a minor miracle. Some brave souls in Hollywood have made a movie about then-Sen. Ted Kennedy's actions in the car accident that left Mary Jo Kopechne dead and abandoned on Massachusetts' Chappaquiddick Island in the summer of 1969. It even stars well-known actors like Bruce Dern, Ed Helms, Kate Mara and Jim Gaffigan. It just debuted at the Toronto International Film Festival. At this moment, one could imagine it as a counter-reaction to taking down Confederate statues. If there's anything in our modern history that needs a reassessment -- or just a reality check -- it's the hidebound mythology around Kennedy, that noble "Lion of the Senate." Some predictable protests broke out from the mythmakers. Former Washington Post reporter Sharon Waxman complained on The Wrap News Inc. website: "I'm not entirely sure why anyone chose to make this movie right now. We hardly lack in narratives that debunk the Kennedy mystique. Indeed, the Kennedys' moral failings are hardly what ails our democracy at this time. Many of us wish there was a Kennedy-esque figure to offer leadership in place of the moral chasm that faces the nation right now." It is always so when it's a Democrat. Throughout 2016, we were told that Hillary Clinton's past scandals were irrelevant. Then-President Obama's scandals? A thing of the past. Former President Bill Clinton's imbroglios? We needed to move on. Indeed, that's why the MoveOn group was born. In this case, it's even worse. The liberal-media establishment -- comprised of the ones who proclaimed from the rooftops that it was mandatory for Donald Trump to abandon his presidential campaign for having boasted to "Access Hollywood" host Billy Bush off camera that he could grab women in the crotch because he was a "star" -- has always believed that leaving a woman behind in an overturned car to drown wasn't at all immoral or disqualifying for the presidency ... when you're "Kennedy-esque." But there was more than one minor miracle. Variety film critic Owen Gleiberman took the opposite take. He wrote: "Kopechne's body was found in a position that implied that she was struggling to keep her head out of the water. And what the film suggests is that once the car turned upside down, she didn't die; she was alive and then drowned, after a period of time, as the water seeped in." Then, the film critic went for the solar plexus, saying, "This makes Edward Kennedy's decision not to report the crime a clear-cut act of criminal negligence -- but in spirit (if not legally), it renders it something closer to an act of killing." He asserted that the Kennedy dynasty using its wealth and power to squash the case is "the essence of what Chappaquiddick means." Both critics agreed that the movie tells the story in an emotionally detached and clinical manner. 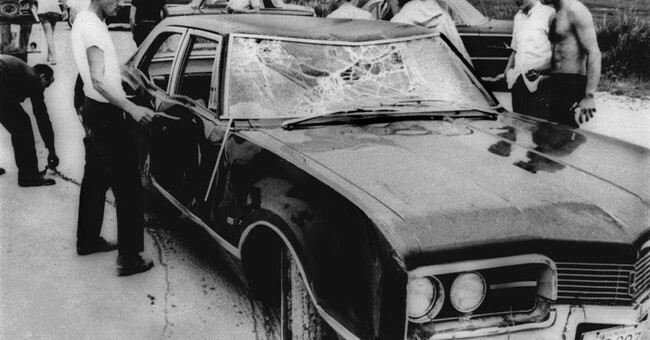 Gleiberman said, "It simply delivers the truth of what happened: the logistical truth of the accident, and also the squirmy truth of what went on in Ted Kennedy's soul." The news media will be left with two options when this movie comes out: They can ignore it, just as they did to hard-hitting books like Leo Damore's best-selling "Senatorial Privilege: The Chappaquiddick Cover-Up" in 1988. Or, if it's too successful to ignore, they can denounce the filmmakers and attempt to shame them as greedheads, just as liberals like Barbara Walters did in 2012 when Mimi Alford came out with a book in which she wrote how then-President John F. Kennedy sexually exploited her when she was a 19-year-old White House intern. For more than half a century, the media elite has presented the Kennedys in oozy, honorific terms as a gallant band of devout Irish Catholic public servants. And they wonder why people denounce them for spreading "fake news."